If you read the Globe & Mail and/or Toronto Star print editions you may have noticed a full page advertorial from Aeroplan discussing redemption options from one of Canada's largest and well known loyalty programs. I was one of the people asked to attend the roundtable and spent an afternoon at Aimia's office in Montreal being interviewed along with two other Aeroplan members and two employees of Aeroplan. The discussions were interesting and it was nice to hear the good and the not so good stories. 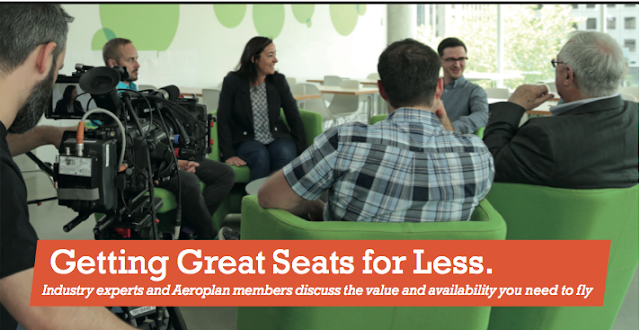 The advertorial from Aeroplan is meant to focus on the value of Aeroplan and the good so you won't hear about the side that has issues, but the one thing you have to remember it is not only Aeroplan that has them. There will be haters who totally disagree with the piece and then there will be those who love Aeroplan and will agree with what is said. This is always the case with features like this. We even get emails from people who disagree with our credit card rankings and that is why we state, even with years of research, that it boils down to opinion and experience. It is what is best for you. For some Aeroplan is best for others it is not. For me, I love program, I've been a member since 1989 (technically earlier if you take into account my Canadian Plus membership) and have used it consistently over the years (both earning and redeeming) and know many others that do as well. So when Aeroplan asked if I wanted to attend, I said sure. For complete disclosure, my expenses were paid (flight, taxi etc.) but I was not compensated for my time. I brought up some of the issues around flight availability, surcharges and even technical issues that have arisen on Aeroplan tickets when trying to change seats but those were more for the Aeroplan employees to take back for their use and knowledge. One aspect in the article talking about one way award tickets was that other programs charge 60-70% of a round trip and this was attributed to me however it was actually stated by Nadine St-Aubin of Aeroplan. I know this typically isn't the case, many charge exactly half and I said that it was great move from Aeroplan to move to a 50% rate like other programs from the previous higher rate they used to charge. Ultimately whether you love or hate Aeroplan or any other program, it comes down to education and knowing the ins and outs of that program. Things like booking one ways versus round trips or redeeming on an airline that doesn't charge a carrier surcharge (YQ) are things that many members are unaware of and should educate themselves about. Did you read the piece? What are your thoughts? You don't have to go into full on rants or raves but I'd love to hear where you think Aeroplan is heading and were they smart to do this piece? Does it change your opinion of Aeroplan? Let us know below in the comments section! Yes, read the page. It really bothered me that it was not mentioned that Terry Quinn, the third person in your group, was a SuperElite and thus had access to any available seat(s) as an award at normal "classic" rates...at least he did at the time the story about his daughter took place. Very misleading considering access to award seats at classic rates is a heated topic. But yes, it was an ad for Aeroplan, so there's no need for disclosure or reveal all the details. As for one-way awards, while Aeroplan has moved to half the r/t rate from its previous 60%/70%, unlike other programs, one-ways must be to or from North America, and cannot be booked within other regions, or between other regions. I did not see it. Can you post a link to it?